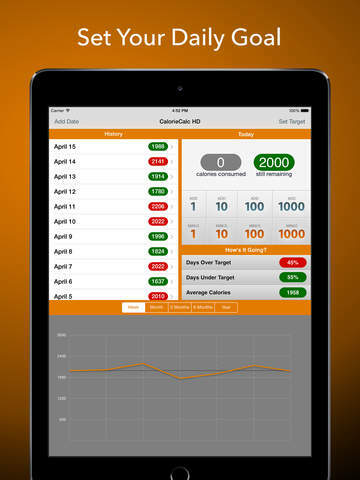 CalorieCalc HD is a fast and simple app to use, allowing you to easily track your daily calorie intake. CalorieCalc HD is designed for speed, allowing you to input your calories on the go as fast as possible, and giving you the information you care about instantly. 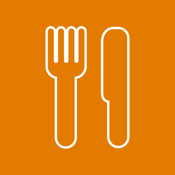 There's no need to sign up or search through huge lists of foods and quantities. You can set your target daily amount of calories. CalorieCalc HD will then show the number of calories in green if you have stayed below or matched your target, or red if you have eaten too much. CalorieCalc HD gives your average daily calories, along with the percentage of how often you are below or above your daily target. CalorieCalc HD also gives you a graph displaying how you have been doing for the last week, month, 3 months, 6 months or year. This allows you to see exactly where you have been in comparison with the target you have set yourself.